In this article, we are going to how the JPQL DISTINCT keyword behaves depending on the underlying entity query type. The addComment method is useful for synchronizing both ends of the bidirectional @OneToMany association. For more details, check out this article. By default, all @ManyToOne and @OneToOne associations are to be fetched eagerly, which is most often a terrible idea. That’s the reason we used the FetchType.LAZY strategy for the @ManyToOne association. "High-Performance Java Persistence eBook has been released!" "High-Performance Java Persistence paperback has been released!" "High-Performance Java Persistence Mach 1 video course has been released!" "High-Performance Java Persistence Mach 2 video course has been released!" Therefore, for scalar queries, the DISTINCT JPQL keyword is needed to be passed to the underlying SQL query since we want the result set to remove duplicates. The DISTINCT keyword has a different purpose when it comes to entity queries. Without using DISTINCT, the JPA specification states that the returning entities resulting from a parent-child JOIN might contain object reference duplicates. As illustrated by the log message, the returned posts List contains two references of the same Post entity object. This is because the JOIN duplicates the parent record for every child row that’s going to be fetched. So, the duplicates were removed from the posts List, but the DISTINCT keyword was also passed to the underlying SQL statement. For this SQL query, the DISTINCT keyword serves no purpose since the result set will contain unique parent-child records. The quicksort execution adds an unneeded overhead to our statement execution since we don’t need to eliminate any duplicates since the result set contains unique parent-child row combinations. Therefore, the DISTINCT keyword is no longer passed to the SQL query, but entity duplicates are removed from the returning posts List. Because the DISTINCT JPQL keyword has two meanings base don the underlying query type, it’s important to pass it through to the SQL statement only for scalar queries where the result set requires duplicates to be removed by the database engine. For parent-child entity queries where the child collection is using JOIN FETCH, the DISTINCT keyword should only be applied after the ResultSet is got from JDBC, therefore avoiding passing DISTINCT to the SQL statement that gets executed. 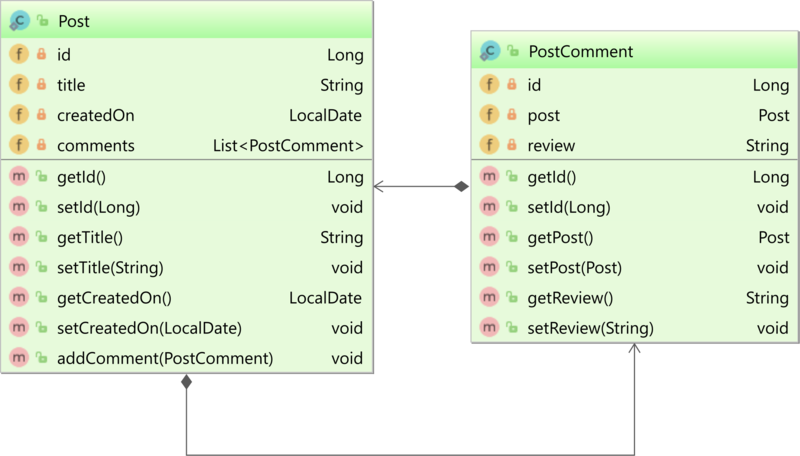 please note that the hint does not take effect if the ‘hibernate.use_sql_comments’ property is enabled. This happens because the ‘org.hibernate.loader.Loader.processDistinctKeyword(…)’ method checks the condition ‘sql.startsWith( SELECT_DISTINCT )’ in order to perform the ‘distinct’ keyword removal. If the ‘hibernate.use_sql_comments’ is enabled the comments (/…/) precede the ‘distinct’ keyword and aforementioned condition check fails. You should create a Jira issue and assign it to me. hello, this is very useful but only in 5.2, what is the best alternative to use in hibernate 5.1 or earlier versions where it is not possible to update? The only way to use this feature and many other optimizations I have added is to upgrade to 5.2 or 5.3.